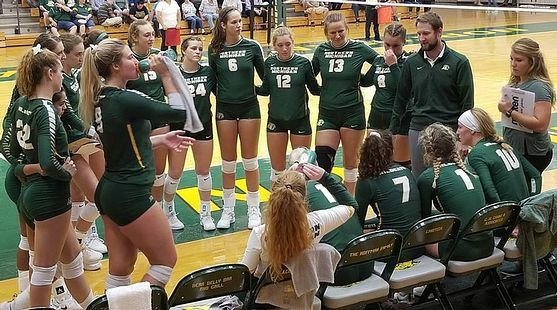 MARQUETTE---The Northern Michigan University women's volleyball team stayed undefeated for the season Friday night, knocking off top-ranked Minnesota-Duluth, 3-1, after also beating Minnesota-Crookston, 3-0, at Vandament Arena. The Wildcats started the day with a 3-0 victory over Crookston, winning 25-16, 25-15 and 25-13. NMU then followed with a 25-23 first set victory against UMD. In the second set, the Wildcats jumped out early and won 25-15. The Bulldogs rebounded in the third set to capture a 25-16 win. In the fourth set, NMU bounced back from an early deficit to win 25-23. Sophomore Leticia Antunes (Florianopolis, Brazil/Colegio Ofelia Fonseca) paced the team's offense for the day with 32 kills, hitting at a .347 clip. Against the #1 Bulldogs, she finished with 21 kills and a .314 hitting percentage. Senior Autumn Monsma (Grand Haven, Mich.) added 20 kills, with 11 against UMD. Junior Sarah Kuehn (Green Bay, Wis./De Pere) had seven against Duluth, and 19 through the day. Senior Maggie Liebeck (Luxemburg, Wis./Luxemburg-Casco) posted seven kills in each match to aid the offense. Senior Lynzi Svoboda (Minneapolis, Minn./Minneapolis Southwest) notched 72 assists, including 40 against UMD. Defensively, senior Rachel Braunschweig (Alamo, Calif./San Ramon Valley) totaled 25 digs and Svoboda had 20. Against the Bulldogs, the pair each tallied 12 digs. Monsma chipped in with 16 for the day, nine in the night's finale. Antunes had 10 in the nightcap and Freshman Alli Yacko (Oak Lawn, Ill.) posted nine against UMD. At the net, Kuehn notched 11 total blocks with six coming against Duluth. Svoboda finished with eight blocks on the day including four against the Bulldogs. With the victories, NMU continues their hot start and improves to 6-0 on the season and will return to action Saturday, taking on St. Cloud State University at 1 p.m. then finishes the Wildcat Open with Bemidji State University at 7 p.m.